Last weekend marked the start of new things for the Kings. New Uniforms, a new forward, Herb Gibson, and a new hunger for victory. 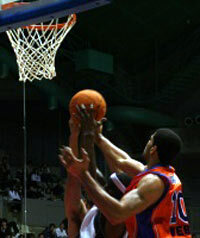 A crowd of 1,650 spectators cheered on the Kings Friday February 25th at the first of two games against the Niigata AlbirexBB. The first match was a low scoring 70 to 69 nail biting victory for the home team. The winning basket was scored with only 2 seconds left in the game by the newcomer Herb Gibson. The second game started with a spectacular dunk from Kings' superstar, Eric Walton. The Kings were high paced and riding on the momentum of their win the day before. 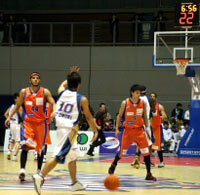 At the end of the first quarter they were out scoring AlbirexBB 22 to 11. The second quarter brought foul trouble for the Kings. Effective team work and a strong shooting percentage by Niigata star Makoto Hasegawa changed the rhythm of the game and the Kings were outscored 23 to 12 by the AlbirexBB. The Kings combination of forward, Han Dae Kyun, on the inside, and team captain, Naoto Takushi, on the outside could not seem to find their rhythm, but managed to outscore Niigata 22 to 20. The AbirexBB came into the fourth quarter ready to play. Defensive rebounds and high foul shot percentage put the final score to 79 for the AlbirexBB to 69 for the frustrated Ryukyu Golden Kings.